Rev. Rick Warren, the best known advocate of California's Proposition 8 gay marriage ban, has staked his reputation as an international humanitarian on his alliance with Kagame, and on his Rwandan and Ugandan HIV/AIDS ministries, which are infamous for hijacking PEPFAR, the President�s Emergency Plan for AIDS Relief, in service to his abstinence-only-until-heterosexual-married -monogamy-for-life agenda. And now Kagame has been sued, in an Oklahoma Court, for guilt in the Rwanda Genocide and the Congo War, which have together cost 7 million African lives. Victoire Ingabire Umuhoza, presidential candidate of the Rwandan FDU-Inkingi Party, is going on trial in Rwanda. 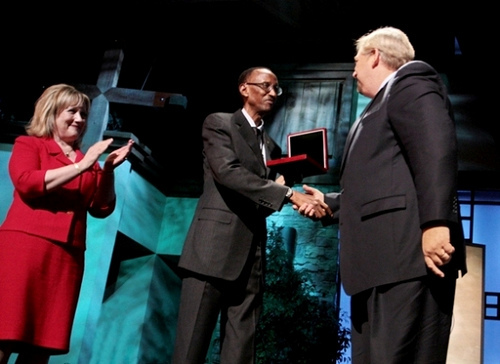 Ingabire is charged with �genocide ideology,� a statutory speech crime unique to Rwanda, and of an �association crime,� associating with terrorists. Eight days after Ingabire�s arrest on April 21 in Rwanda�s capital, Kigali, a team of U.S. lawyers filed a civil lawsuit against Rwandan President Paul Kagame in Oklahoma City alleging Kagame ordered the political assassinations that triggered the Rwanda Genocide, costing one million Rwandan lives, and that he engaged in racketeering to control the vast natural resources of eastern Congo across Rwanda�s western border at a cost of six-million Congolese lives. The international legal strategies and geostrategic implications of these parallel, competing courtroom dramas, are huge and historic. Like any trials of such import, they will become trials in the court of pubic opinion. Read full story at Fog City Journal, http://www.fogcityjournal.com/wordpress/2010/05/reverend-rick-warren-on-trial-in-the-court-of-public-opinion/.